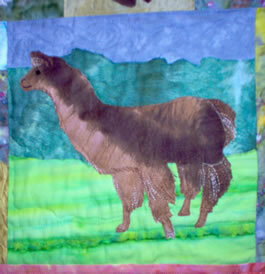 There are 18 full sized drawings of llamas and alpacas, with instructions for raw edge appliqué, machine quilting, binding the quilt, and signing your name freehand on the sewing machine. You can arrange the critters any way you like, such as in a single scene or rearrange the blocks. I did a lot of thread painting on the dense fur around the necks and legs with variegated threads: black/gray/white, and shades of brown. This is just straight stitching back and forth, drawing the dreadlocks. The quilt on the pattern cover is 34” wide x 36” high. 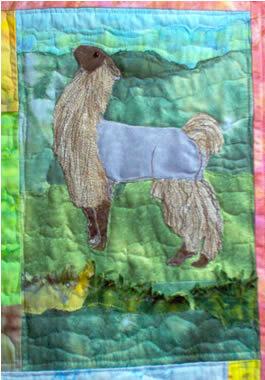 Check out the detail photos of the Woolly Sheep quilt I made with wool suiting fabrics and hand embroidery stitches. The Llamas and Alpacas could also be done with felting to make them more 3-D. You could use llama or alpaca fibers for a realistic look. Where would you get these fibers? Google it. 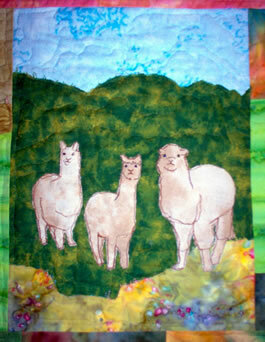 The new quilt with the wools is called Crazy Sheep. 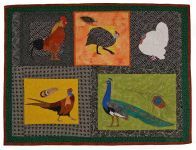 That quilt won first prize in innovative quilts at Road to CA. A new wool quilt is being worked on with a different layout. This one will be called Sheep Wannabees. 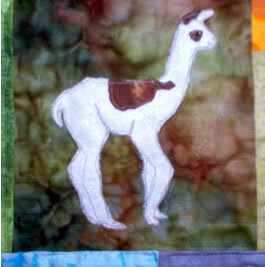 You can see this quilt on my blog www.critterpat.blogspot.com in my early February 2010 entry. Within 24 hours of placing your order for the PDF version of this pattern, you will receive an email with a link directing you to the download location.